NOTES: Though many didn’t give Savage a chance on this night, I was rooting for him with a packed house for my WrestleMania party. This was a memorable match for sure with Flair bleeding all over the place. Savage pulled it out using questionable tactics (a handful of tights), but nobody ever said Savage always played by the rules. This was an awesome surprise World Title victory. NOTES: Savage claims the big prize for the first time in his career, winning four matches in one night. The finale of arguably the greatest tournament in pro wrestling history included interference from Andre The Giant and Hulk Hogan, but it wrapped up with Savage dropping a picture-perfect flying elbow and celebrating with Liz on his shoulder in their famous pose. NOTES: Though the Warrior was an extremely popular performer, he certainly wasn’t well known for his match quality. With few exceptions, Warrior was out of gas and putting on pathetic matches. This night was different though. Randy was so phenomenal in this match that people still talk about it 20 years later. Multiple flying elbow drops and a touching reunion with the lovely Elizabeth highlight the finish to this spectacle. NOTES: This show had one of the biggest buy rates for any wrestling pay-per-view thanks to a phenomenal year-long storyline that culminated in the explosion of the Mega Powers at Atlantic City’s Trump Plaza. Savage carried Hogan to arguably the finest match of his career. NOTES: This is probably the biggest event in wrestling history and Macho Man stole the show with Steamboat, putting on one of the greatest and most dramatic matches the world has ever witnessed. 78,000 (or 93,000, depending on who you ask) were there live to see this classic confrontation in Detroit’s Pontiac Silverdome. 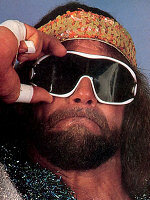 Rest in peace, Macho Man.